It did happen. Luigi’s Mansion was released later that year alongside the GameCube. For the second time ever, Luigi was the one and only star. Just like his last shot at the limelight, he was out to save Mario, who’d this time been kidnapped by the ghosts haunting a creepy mansion. The game was a technical showpiece for Nintendo’s little lunchbox that could, but its fancy lighting tricks and dust particles are nowhere near as impressive as the ambitious, considered creation that is Luigi himself. The details of his exaggerated movements and actions were carefully drawn from the same relatable quirks laid out in his Paper Mario diary. Without much dialogue to lean on, they paint Luigi as a lively, flawed human hero, the likes of which are more endearing than his iconic brother could ever be. “Iconic”—that’s ultimately what the personality disparity comes down to. Mario is more icon than character. He’s a smiling mustache and a handful of jubilant yawps. His role is that of the archetypal cartoon hero, a goody-two-shoes Mickey Mouse in plumber’s clothing whose sole personality trait is an unflinching spirit that mirrors the determination of the player. And that’s okay. He doesn’t need to be anything more, nor should he be. But it also means that Mario isn’t afforded the room for expression that makes his brother’s turn in Luigi’s Mansion so charming and saves the game from becoming a shallow console-launch showpiece. Just like the entries in his diary, though, Luigi shows glints of confidence and pride that are soon overtaken by anxiety. When he collects a key or a novelty-sized gem stone, he holds it up and mugs for the camera with a wild grin before shoving it into his infinite overalls pocket so he may resume cowering. He even sneaks in some cheesy jokes and musings if you ask him to inspect the mansion’s furnishings. “Looks like a fun place to make shadow puppets,” he says to an old film projector. The offbeat details like that shadow puppets line get to the heart of Luigi’s appeal. He’s not a traditional hero like his brother. He’s a goofball. 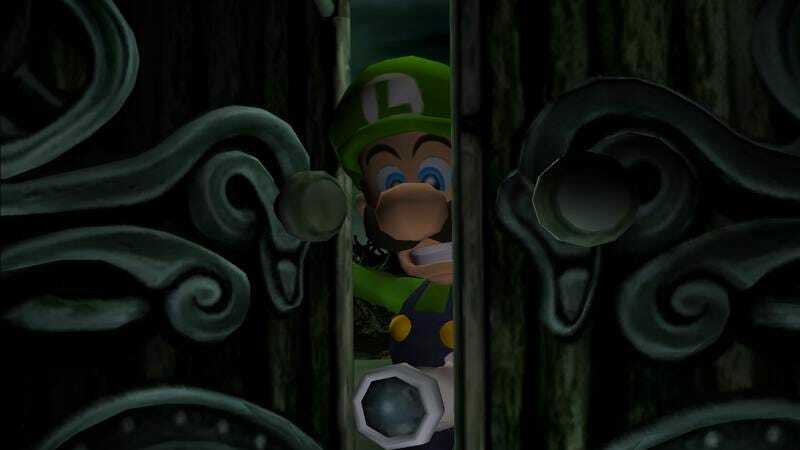 Luigi doesn’t walk; he slinks on his tippy toes with his arms out to the side because, surely, the poltergeists that litter the mansion’s hallways won’t hear him coming that way. When he runs, he gyrates his arms like a kid pretending to be a choo-choo train. Even when he has a video chat with Professor E. Gadd, inventor extraordinaire and Luigi’s phantom-fighting guide, Luigi can’t resist playing with his Game Boy Horror communicator. He pokes at the buttons, wide-eyed and agape. Just look at him. He probably isn’t even listening to a damn thing E. Gadd is saying. The professor never should have programmed Snake onto that thing. But you know Mario would have hung on E. Gadd’s every word. Mario would have listened and nodded along. He’d sign off with a thumbs-up and an “mm-hm!” and be off yet again, an empty vessel with nothing but a mission in his mind and fire in his heart. Steadfast heroism has its place, but when it comes to making an emotional connection with the player, it can’t replace weakness and honesty. Mario might get all the glory, Luigi, but you’ve got the heart.